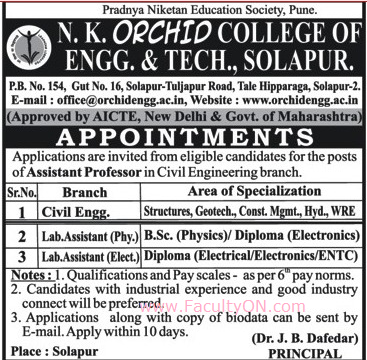 N.K.Orchid College of Engineering and Technology, Solapur has advertised for the recruitment of Assistant Professor / Lab Assistants jobs vacancies. Interested and eligible job aspirants are requested to apply within 10 days from 01st December 2018. Check out further more details below. About College : The Nagesh Karajagi Orchid College Of Engineering & Technology, Solapur Started in the year 2008-2009 after getting approval from AICTE, New Delhi and recognized by Government Of Maharashtra. It is affilated to Solapur University, Solapur and run by The Pradnya Niketan Education Society, Pune - (PNES). From 2017-18, First Year Engg. of UG course is affiliated to the State Technological University, Maharashatra i.e. Dr. Babasaheb Ambedkar Technological University(BATU). Salary: As per 6th pay norms. How to Apply: Interested and eligible candidates are requested to send their CV along with copies of certificates and a recent PP size photo to the following postal address or email address.